I lifted this picture from Miguel over at Gun Free Zone, because it shows the Remington R51 in someone’s hand at SHOT show. Now, originally we received some size numbers on the pistol stating that it has a 6″ overall length, and a 4.5″ height. The 6″ length was really attractive to me, as it puts the R51 in smaller than many of the other pistols in its class. Unfortunately after looking at the above picture, the picture taker either has the world’s smallest hands, or the R51 is a bit bigger than we originally thought. This isn’t a deal breaker, but it is a little disappointing. Andrew over at Vuurwapen Blog has a nice comparison with the R51 next to a 1911, and his Benchmade Mini-Griptillian. All this over a measly 3/4″? Yep. If the pistol is 6″ long, it’s the smallest in it’s class. Smaller than the S&W Shield, Springfield XDs, and all the rest. However, if the pistol is 6.78″ long, it becomes one of the biggest in it’s class, and I really don’t see any advantage with the R51 over the Shield or XDs. Here’s the new comparisons using the numbers from the SHOT show brochure on the Remington R51. Check it out! March Update: I had the chance to shoot an R51 recently. I talk about it in detail in Episode 73 of the podcast. Listen here. I looked at that too, but the distance to the bore axis is fairly small which has allowed a longer grip for the same size. “and I really don’t see any advantage with the R51 over the Shield or XDs.” what about lower bore axis or fewer sharp edges? There’s that, but I’ve never had any issues with the XDs digging me with sharp edges, except for the magazine baseplate when carrying appendix, and I remedied that with a sheet of sandpaper. lower bore axis, less recoil, soft shooting, light slide spring. check, check, check, check. sign me up. What I want to know is when its double stack and full size versions come out, and its R53 version. At 6.75 inches overall length it is half an inch longer than my P64. Readily willing to trade half an inch for what appears to be substantially reduced recoil and muzzle flip [and much of that length appears to be behind the grip]. Mr. P64ski is quite snippy for a 9×18. 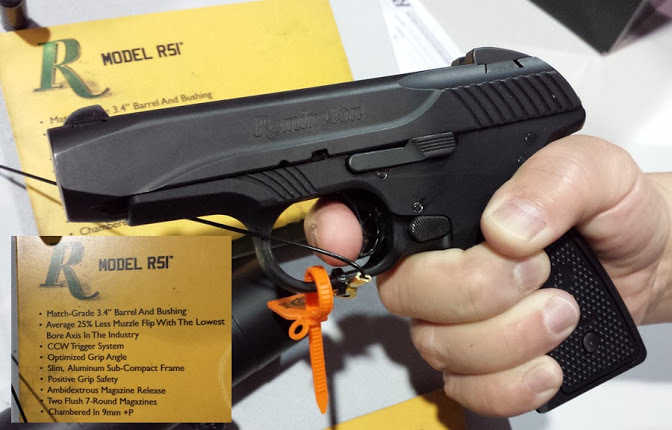 Hope the R51 gets a pinky flair for the mag and/or a mag extension…..A nice hogue grip similar to the one they have for the ruger P85 would be nice too. Its not about hiding it in my skivies. 😉 Be nice if the wife would use it for practice too, and that ain’t happening with Mr. P64ski. I could care less that the R51 is longer than the Shield by only 1/2 of an inch. Yeah, looks like it’ll be about the size of the XDs 4.0. LOL.Funny kid. It is like 1911. I used to be able to take it apart and assemble it blind folded. People keep on saying that Remington has not put out the official dimensions. Did anyone look at their Shot Show brochure? I mean – they must have given out thousands of copies of it. Unfortunately I wasn’t as SHOT, thanks, that’ll be very helpful. Now, up date those comparison diagrams and finish dashing everyone’s dream. Check back tonight or tomorrow morning, and I’ll have them up. Started them this morning, but didn’t finish. I’ve got the official dimensions now, 6 5/8″ OAL. It’s right about the size of a Shield, but with a longer slide/barrel. I’ll have the comparison pics up this afternoon.